LiveWell Colorado is working to bolster access to fruits and vegetables by providing funds for low-income families to spend at the Durango Farmers Market. Access to healthy, local food can help prevent long-term chronic disease. Low-income residents are spending thousands of dollars more on fruits and vegetables at the Durango Farmers Market in recent years thanks to a statewide nonprofit that works to expand access to healthy food. LiveWell Colorado provided about $4,000 in 2017 and about $8,000 in 2018 for fresh produce at the Durango Farmers Market. The nonprofit tries to ensure access to produce through its Double Up Food Bucks program, which provides vouchers for food to low-income families that qualify for Supplemental Nutrition Assistance Program, formerly known as food stamps. The program provides $20 in matching funds for fruits and vegetables each time a family visits the farmers market. “Fruits and vegetables are sometimes the last thing people are able to incorporate into their diet,” said Amy Nelms, food access coordinator for LiveWell. In Durango, 170 families participated in the program last year. Participation has grown steadily since it was launched in 2016, she said. About 7,800 residents were eligible for SNAP between 2014 and 2016 in La Plata County, according to the Colorado Center on Law and Policy and Hunger Free Colorado. 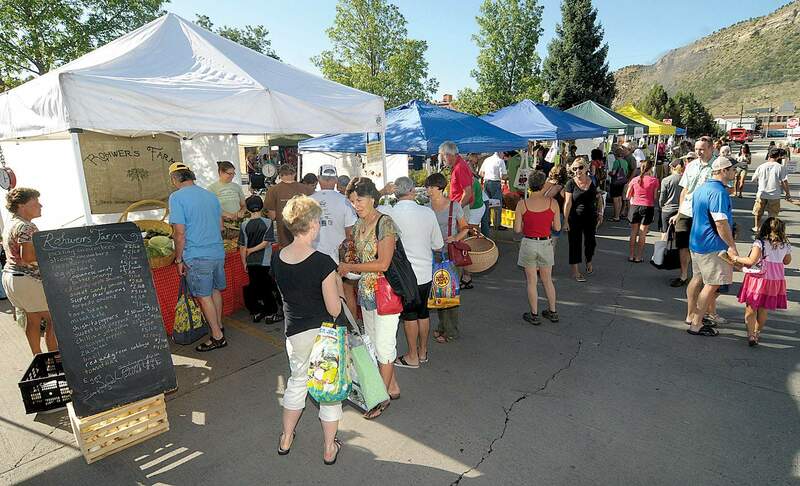 The program is also available at farmers markets in Cortez, Mancos and Bayfield, she said. Improving access to healthy food, specifically through farmers markets, was recommended as a measure to improve diets of low-income residents in a 2018 Centers for Disease Control and Prevention report. Most Americans would benefit from eating more fruits and vegetables, because poor diet can contribute to diseases such as heart disease, Type 2 diabetes and some cancers, according to the report. In La Plata County, the top two leading causes of death in 2017 were heart disease and cancer, according to state data. Nationally, only 12.2 percent of adults eat the recommended amounts of fruit daily and only 9.3 percent of adults eat the recommended amount of vegetables daily, according to the report. The CDC recommends adults eat 1.5 cups to 2 cups of fruits and 2 cups to 3 cups of vegetables per day. “You should not be dying of chronic disease because you didn’t have access to healthy food,” said Rebecca McKibben, a program associate with Cooking Matters. Cooking Matters, which works closely with LiveWell, educates parents and child care providers who have limited food budgets about how to shop for and cook healthy, affordable meals. The program seeks to reach young children up to 5 years old to encourage healthy eating habits to promote long-term health, she said. In Montezuma, Archuleta and La Plata counties, Cooking Matters classes have reached between 750 and 1,000 residents, she said. “Eating not only healthy food, but local real healthy food is a beautiful opportunity. ... It’s not a privilege; it’s a right, in my opinion,” McKibben said.